Google “The Aeolian Islands”. Go on, I dare ya. I myself have not ever been, but the images are enough for me to know that I would like to spend some time on a yacht sailing around this archipelago off the coast of Sicily…if I win the lottery, of course. Should you find me on a yacht one day, you would perchance find me sailing towards Salina, a beautifully green island filled with grapes, olives and capers. Nestled in this landscape one finds a very small producer called Virgona who craft delicious wines from their native grapes. 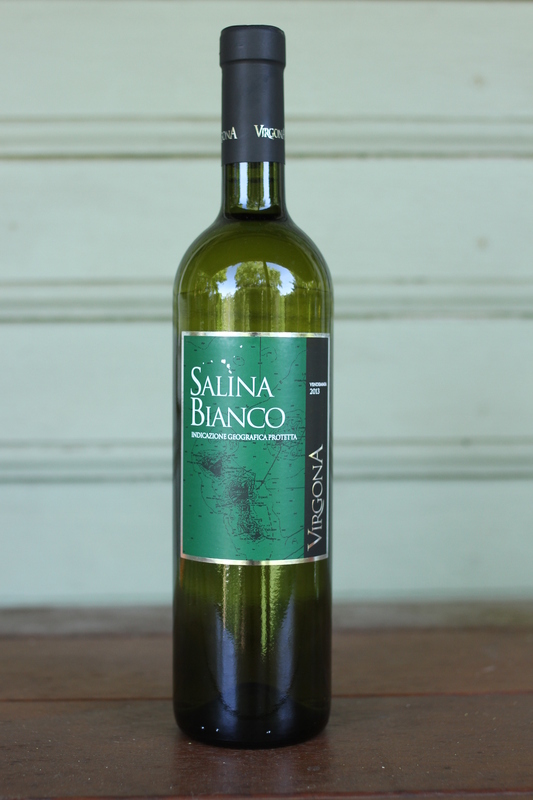 Surrounded by greenery and clear blue water, they make this white wine called Salina Bianco from a blend of three grapes: Malvasia, Inzolia and Catarratto. Malvasia is the more aromatic of the three grapes, which provides the generous nose that opens with aromatics of apricot skin, apple, cinnamon and jasmine. The palate is crisp with punchy acidity that is balanced generously with the apple and apricot flavours. There is also a slight salty effect that I like to think is attributed to the fact that the vines are grown so close to the sea. Wonderfully dry to the finish, this would actually be a great accompaniment to fatty charcuterie as well as the more obvious choice of fish cooked with butter and capers.